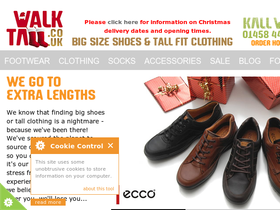 WalkTall at walktall.co.uk is one of the leading suppliers of oversize men's clothing and shoes with a range of goods from some of the most recognised and top brands available on the market. Walk Tall has a huge range of trainers, boots, trousers and suits in the latest fashions, with all the big brands such as Nike, Adidas, Vans and Merrell. Go to VoucherGurus.co.uk first to get the best Walk Tall discounts, Walk Tall vouchers and Walk Tall savings. use free voucher code to score 10% savings on your order from WalkTall.co.uk.